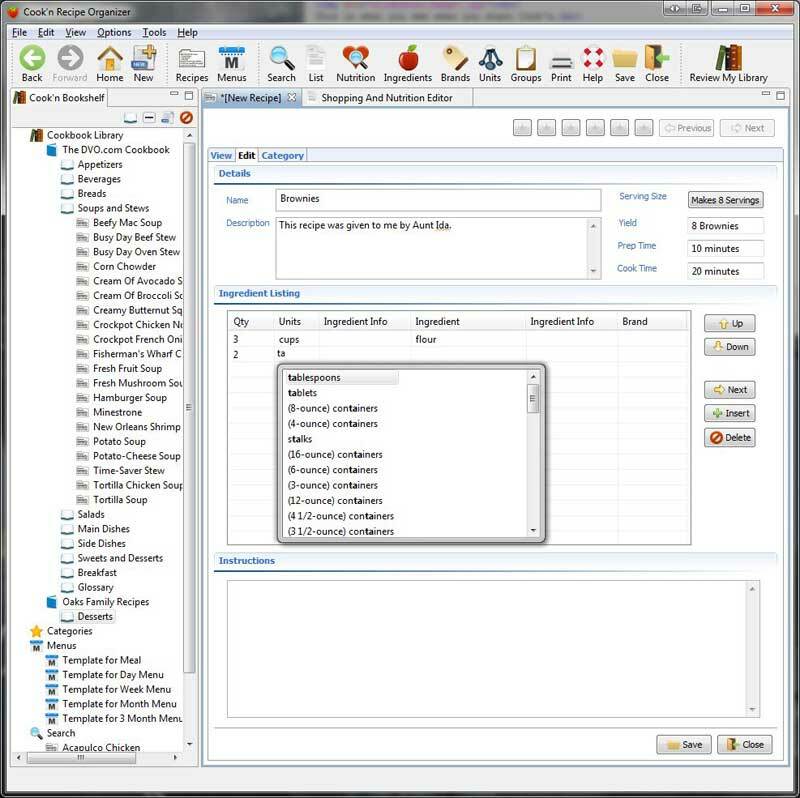 ...it's just like browsing a web site. 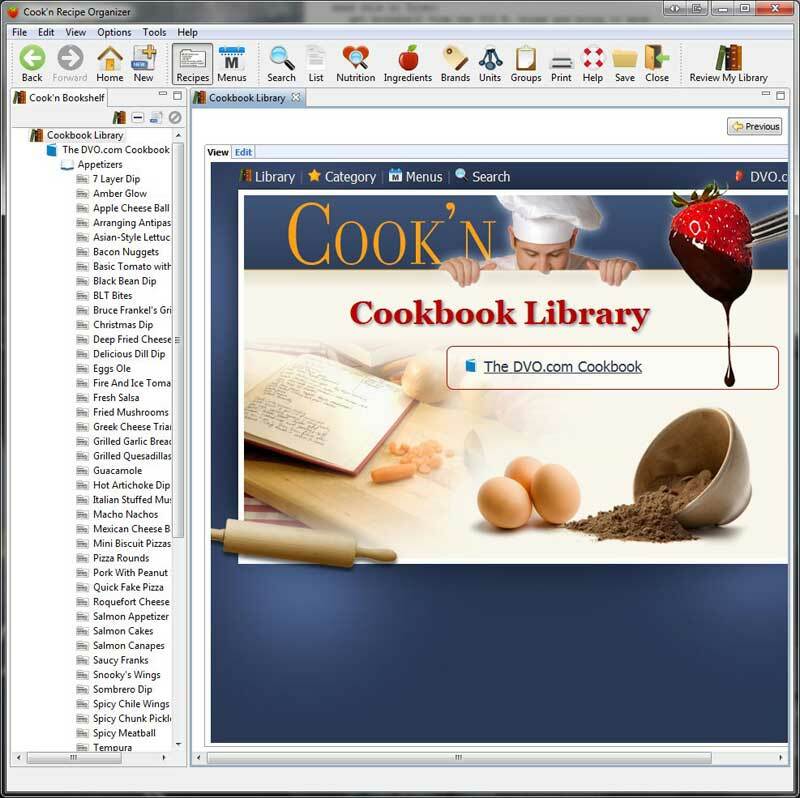 Just click "Cookbook Library" to see your cookbooks! 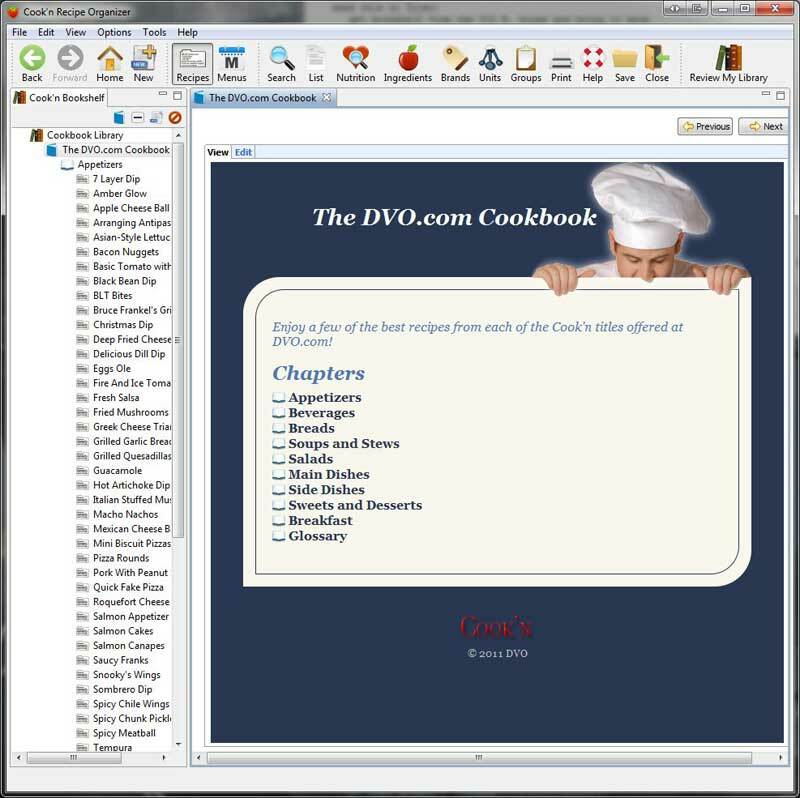 The DVO.com Cookbook that comes with Cook'n includes 368 of our best recipes! 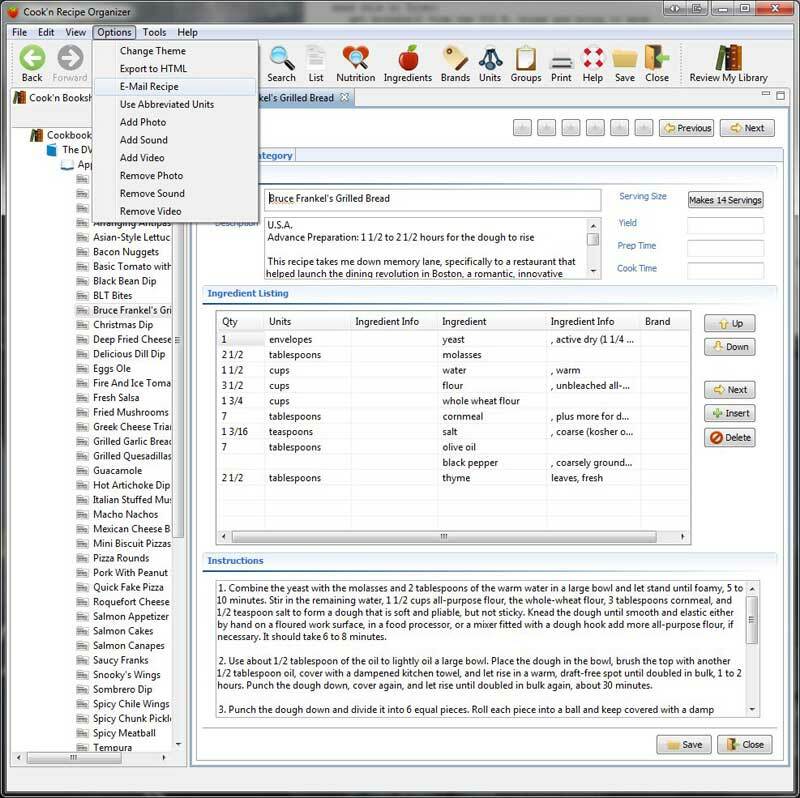 Advanced users can find their recipes quickly using the tree-view on the left. This 7 Layer Dip recipe looks like it could be good! 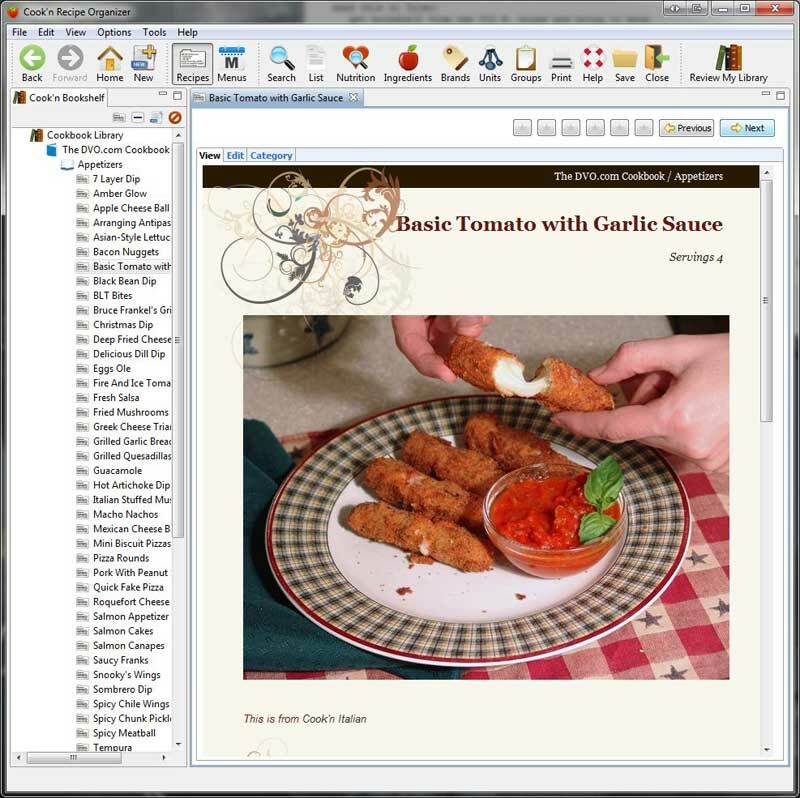 Browsing for good recipes is easy. 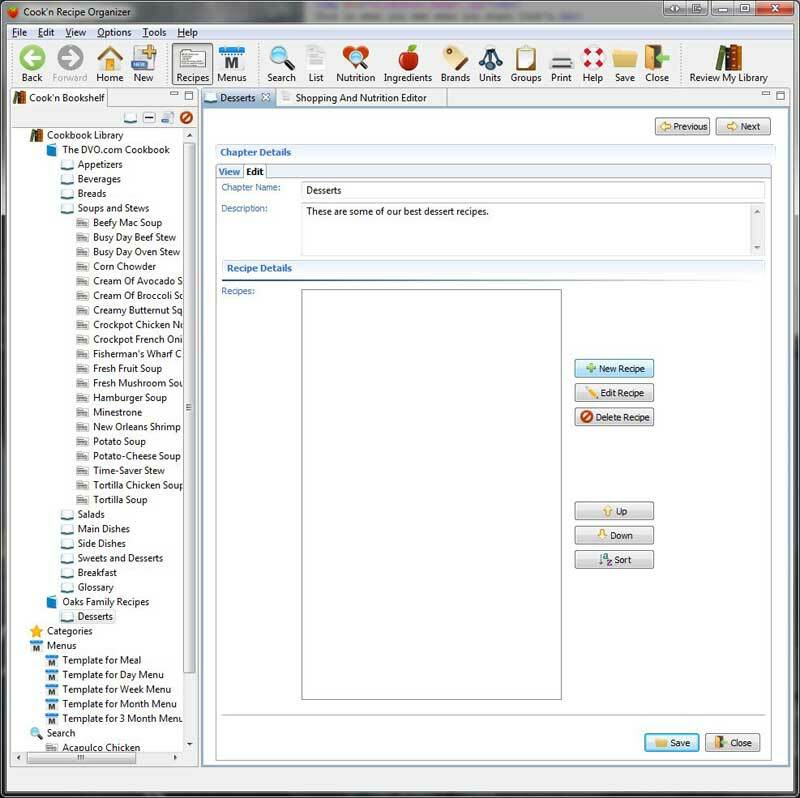 Clicking the Next button in the top right corner is like flipping pages in a cookbook. 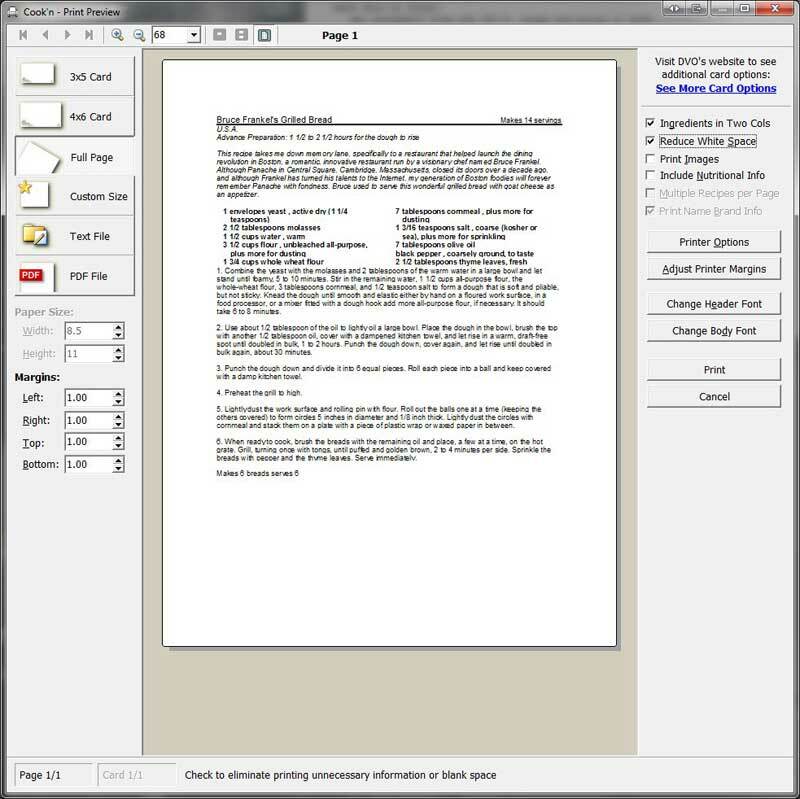 Just click Next, Next, Next to go from one recipe to the next! Oh look...this cookbook includes more than just recipes. Yum! My mouth is starting to water! Wow! This looks really good too. 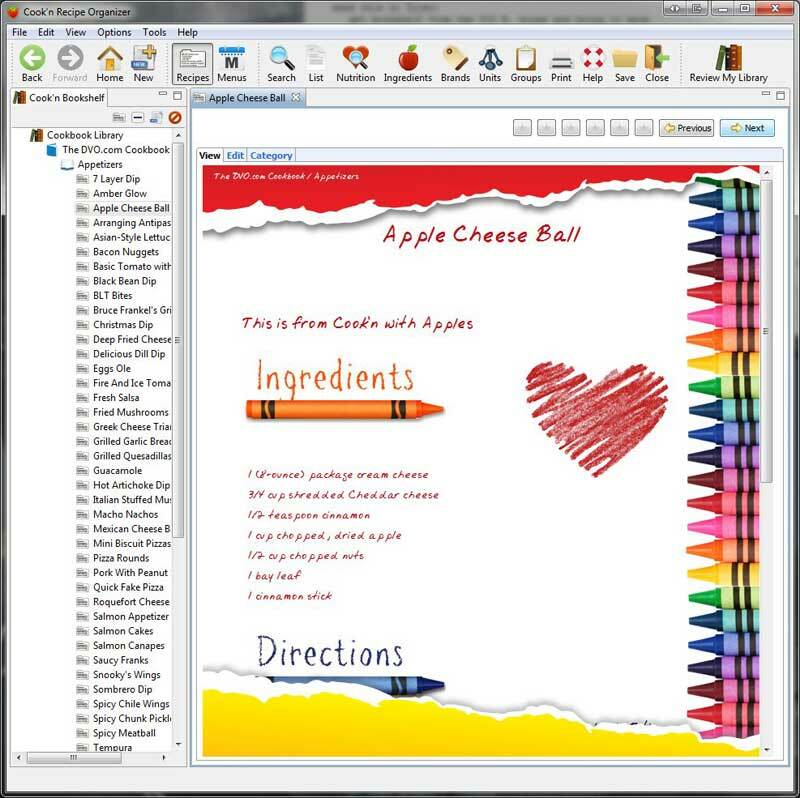 As you can tell, recipes in Cook'n are displayed in a colorful, graphical way that makes using the software very enjoyable! 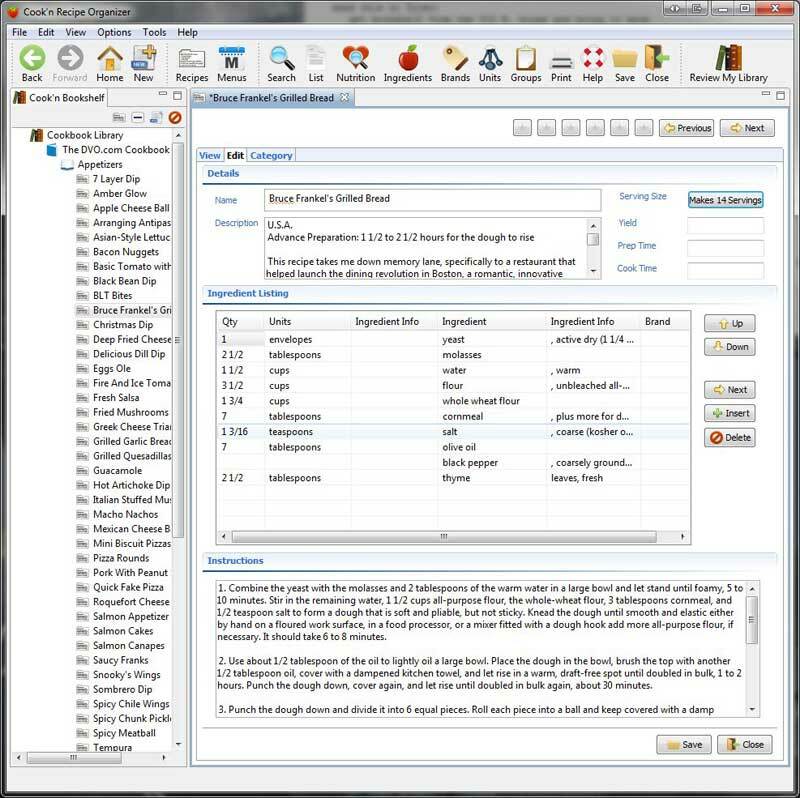 With over 20 different themes to choose from, each recipe has a character and personality of its own! You can assign themes to your recipes and TOTALLY customize their appearance! No other recipe software has the capability of displaying your recipes in such a fun, colorful variety. 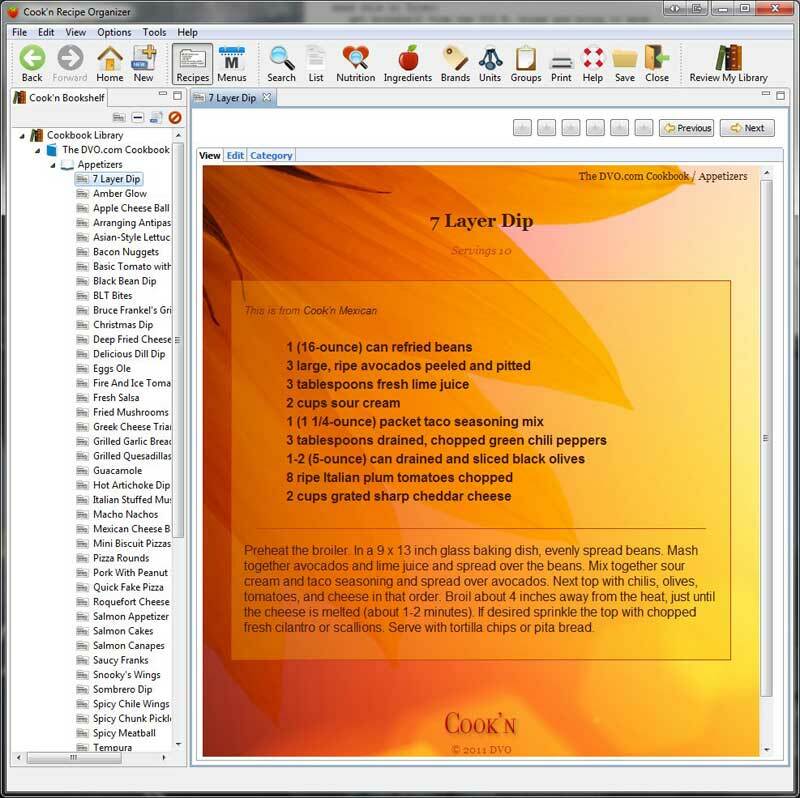 Just click the Edit tab to make changes to any recipe. This recipe looks good but it only serves 6 and we have 14 people coming over. No problem with Cook'n! 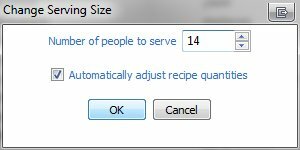 Just tell Cook'n how many people want to serve! 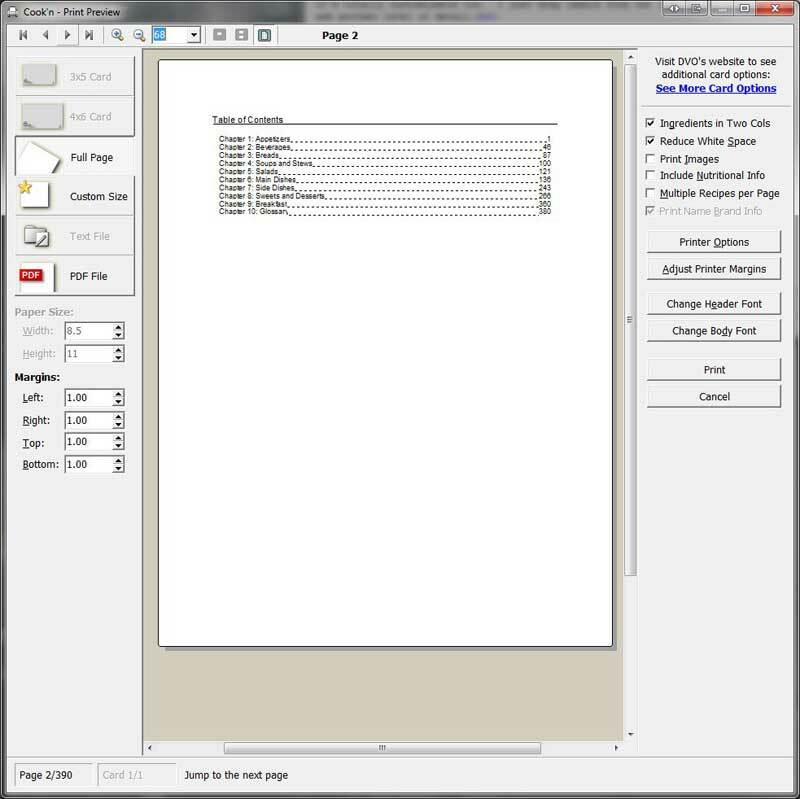 Cook'n automatically adjusts the quantities for you! 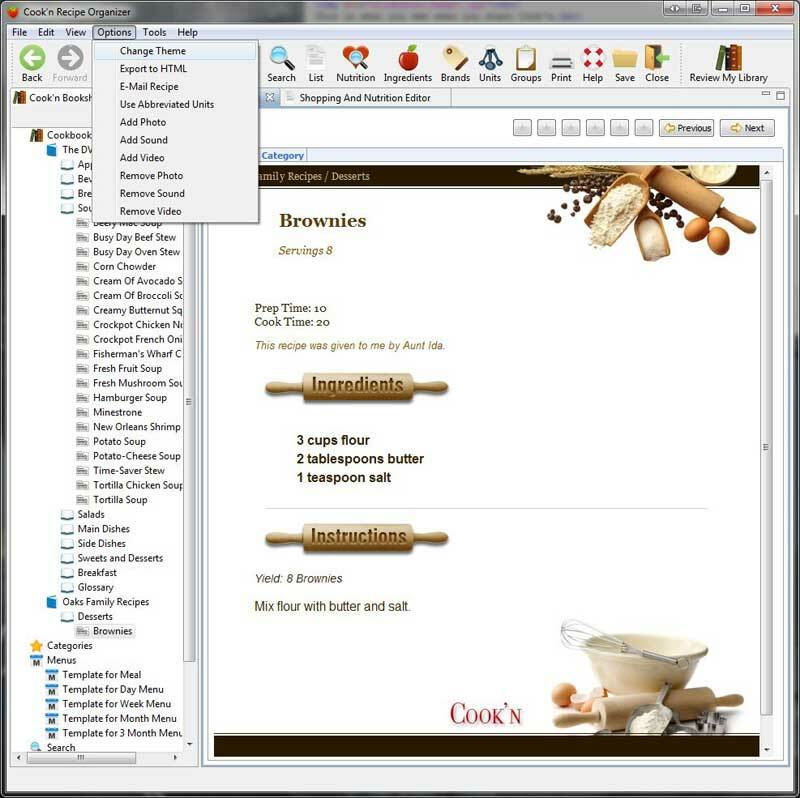 Sharing recipes is easy too...just click Options->E-Mail Recipe. 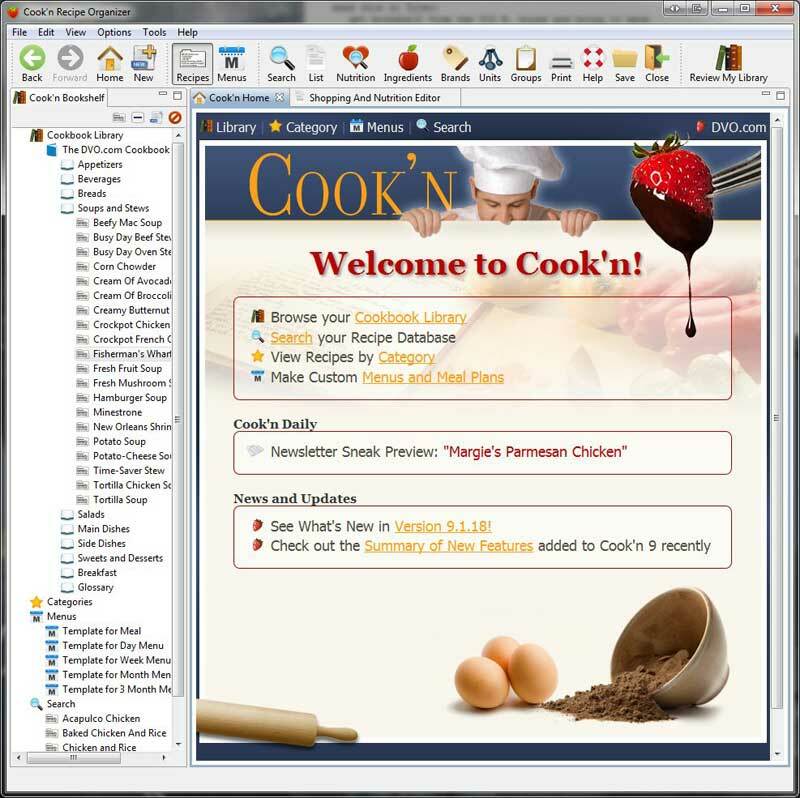 Cook'n will e-mail one recipe or multiple recipes at once! 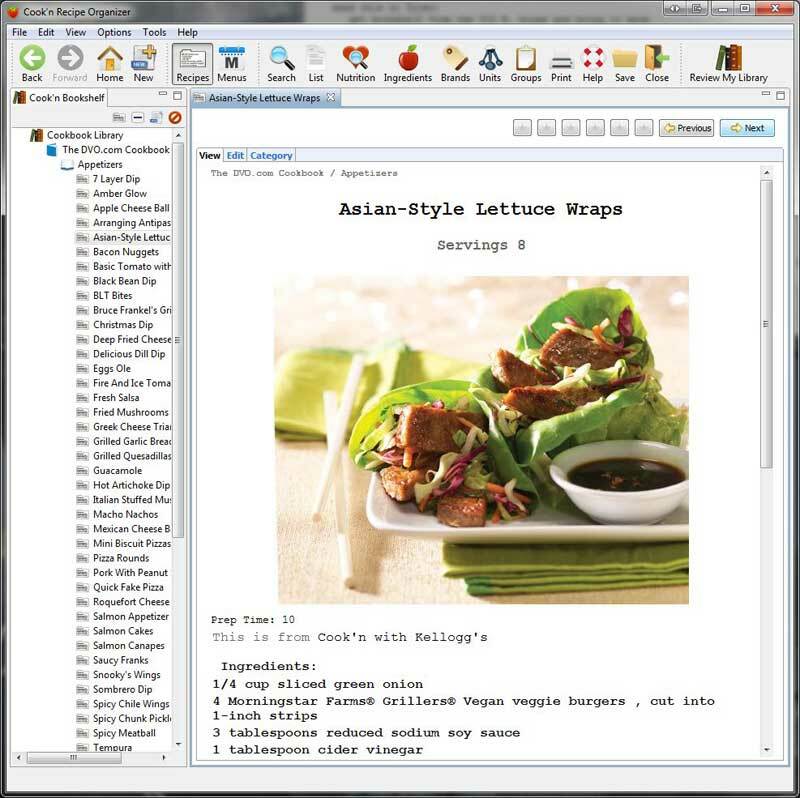 Or, click Print on the toolbar and Cook'n will print your recipe. 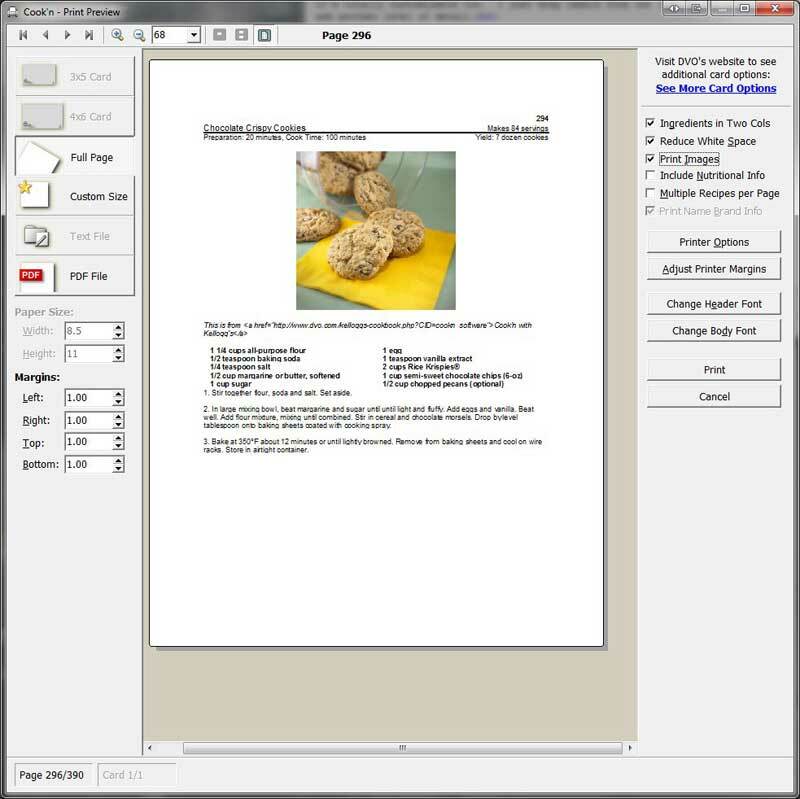 Cook'n will print your recipes on Full Pages or 3x5 and 4x6 cards. 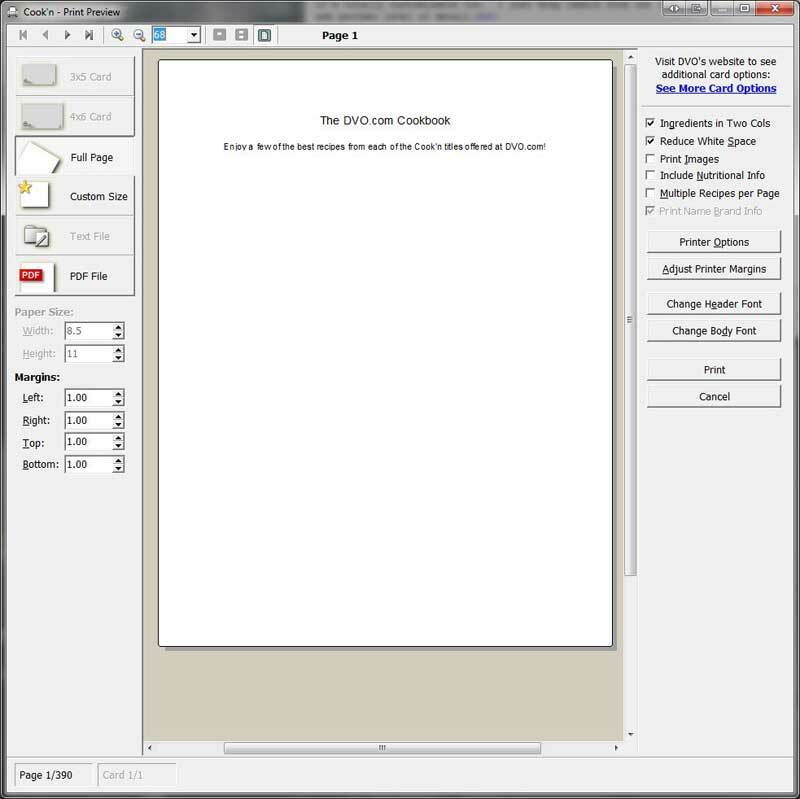 When Cook'n prints your Cookbook, it makes a Title Page. 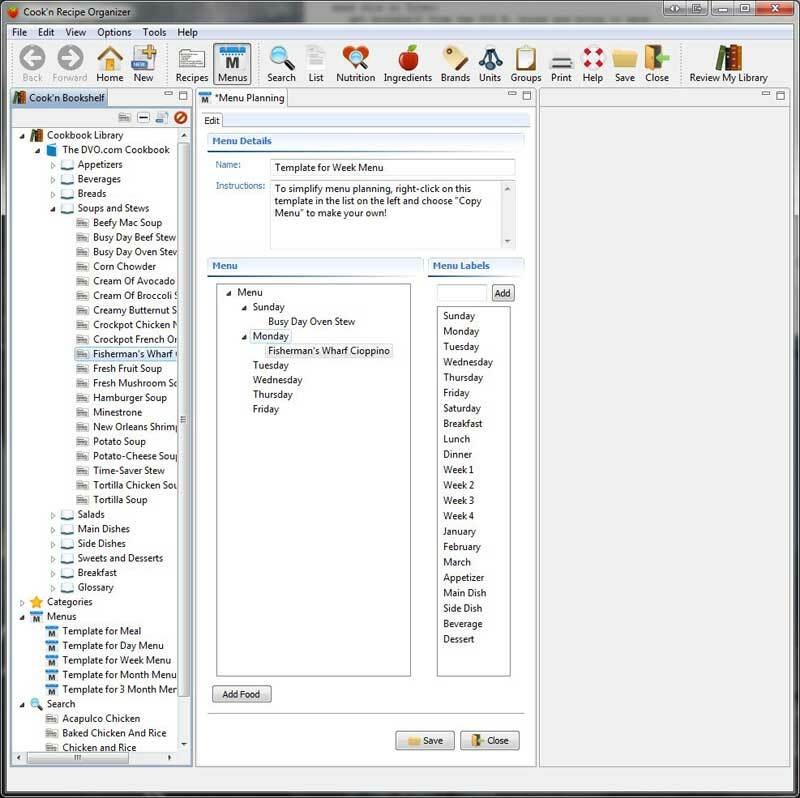 Cook'n makes a Table of Contents. 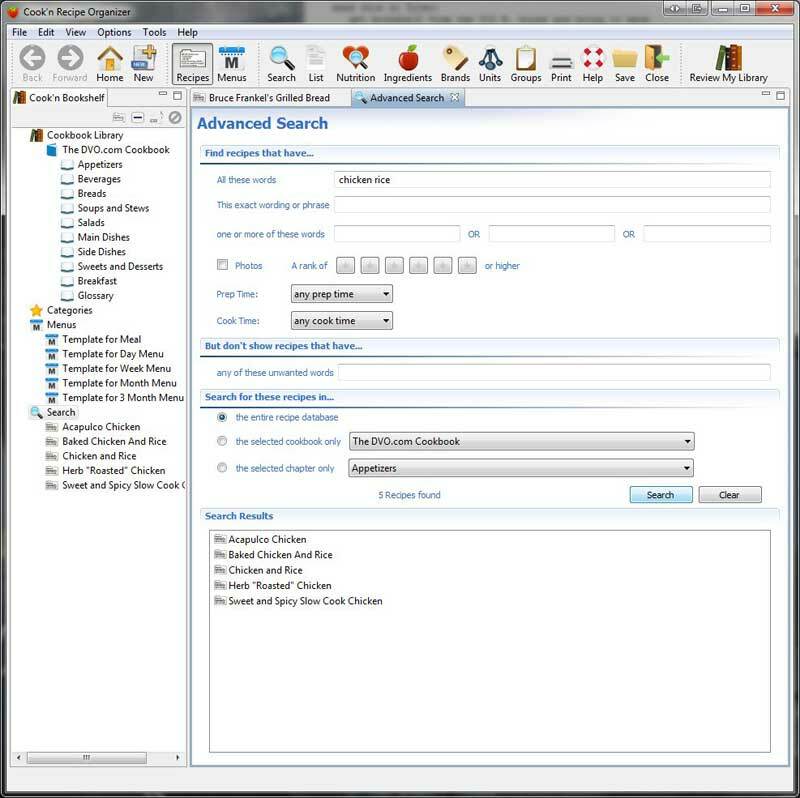 Just click Search on the toolbar and tell Cook'n what you have on hand and Cook'n will tell you what you can make for dinner! 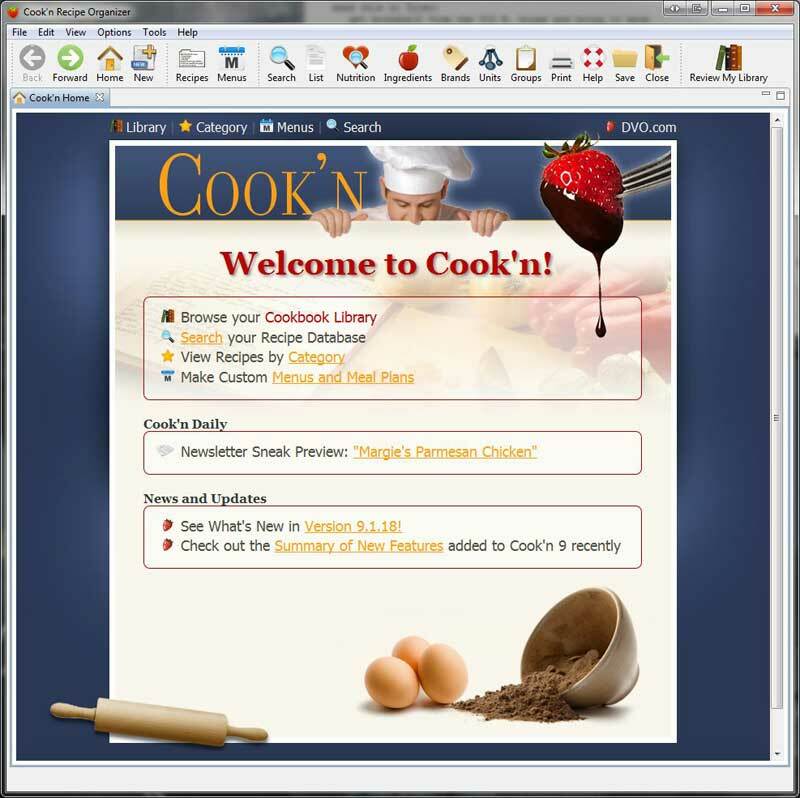 Cook'n's User Interface is simple and intuitive...but it's also very powerful. 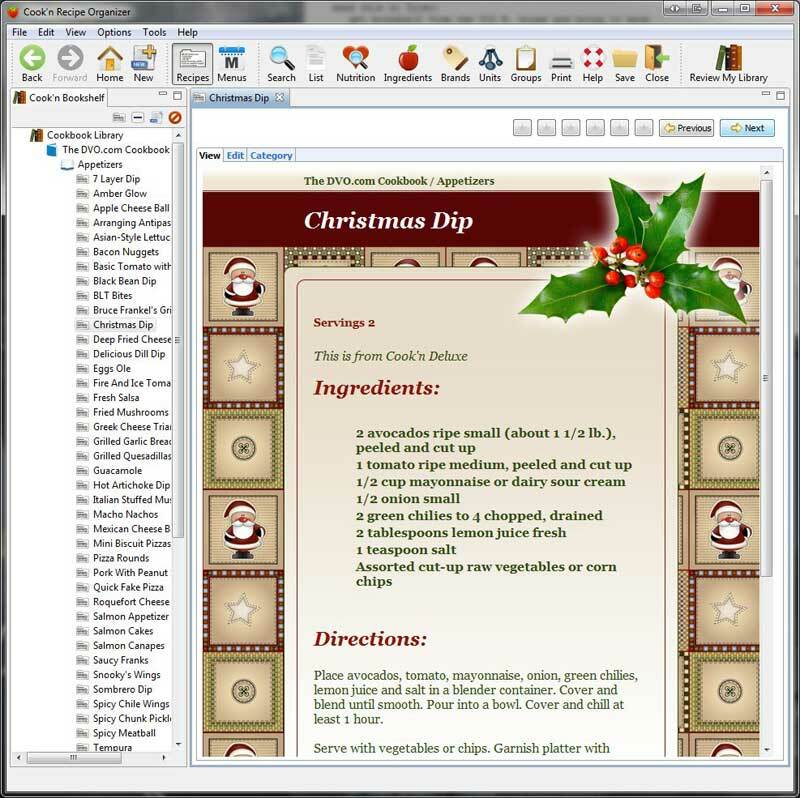 In this case, I wanted to see all four recipes on the screen at once. This is amazing! 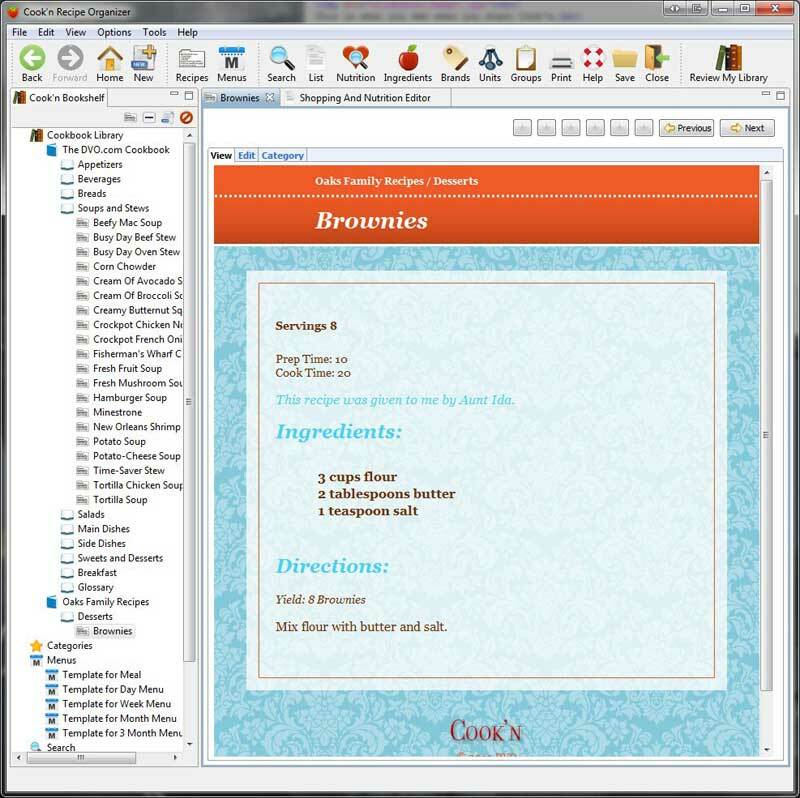 Cook'n makes Menu Planning easy...Start from scratch or build on an existing template. 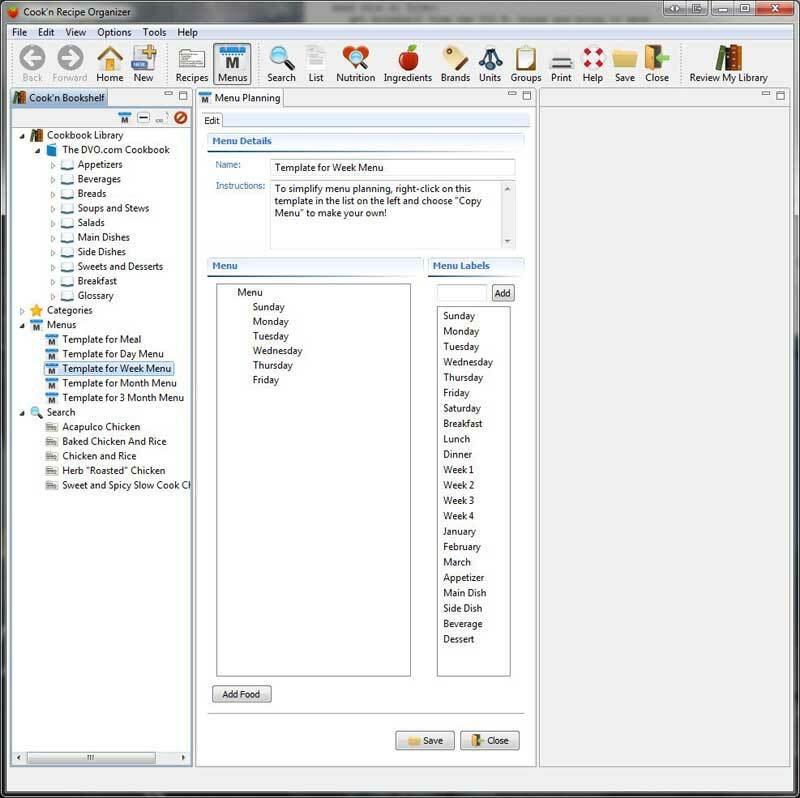 To make your menu, just drag recipes from the list on the left and drop them on your menu on the right. Making a menu couldn't be easier! 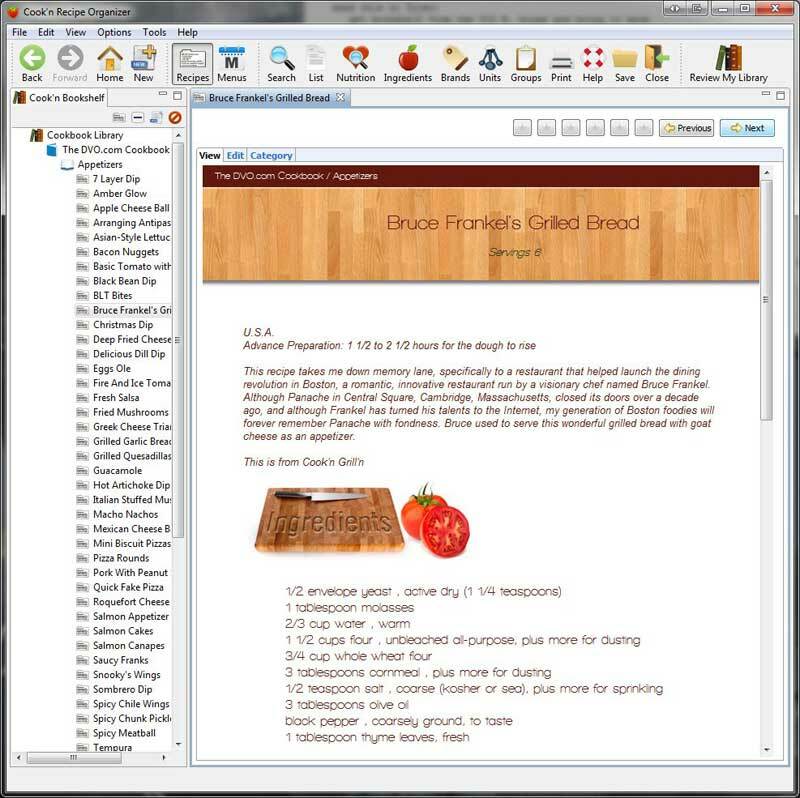 Double-clicking the recipe displays a preview of it on the right. 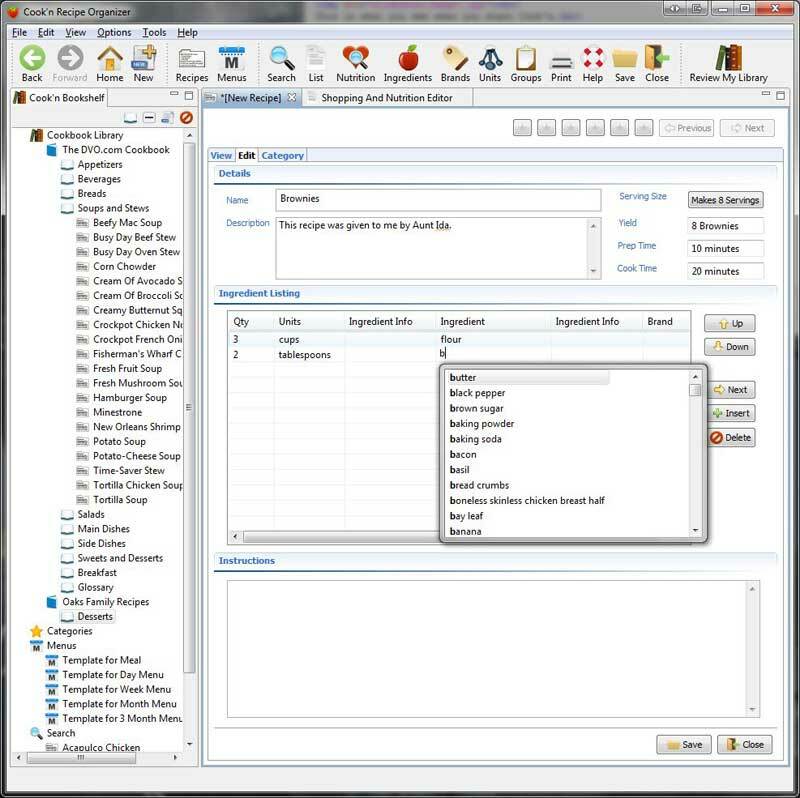 It's totally customizable too. 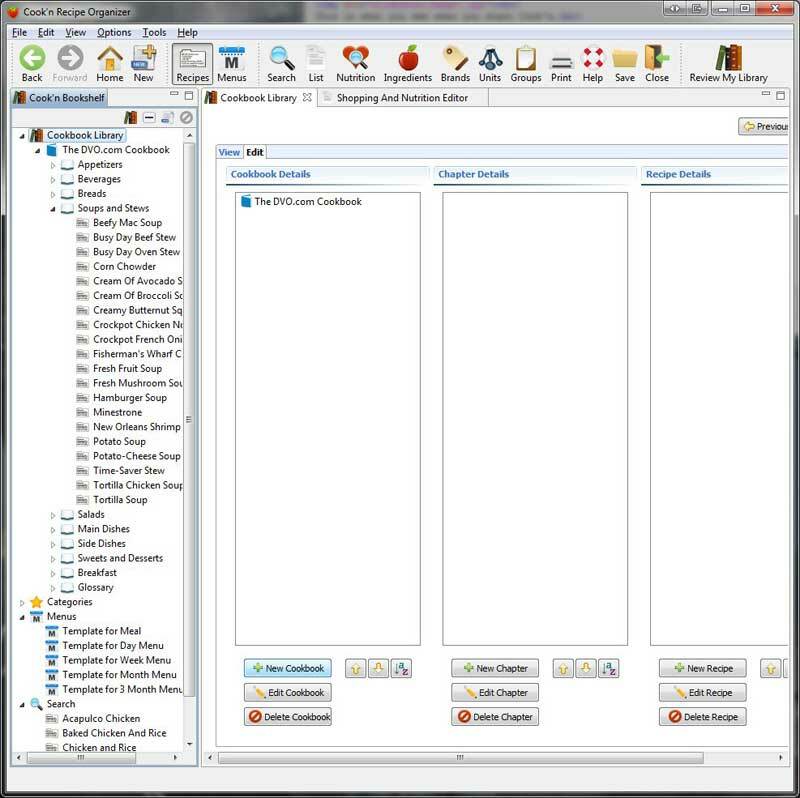 I just drag labels from the list on the right and drop them on Tuesday to add another level of detail. Tortilla soup sounds like a good appetizer! 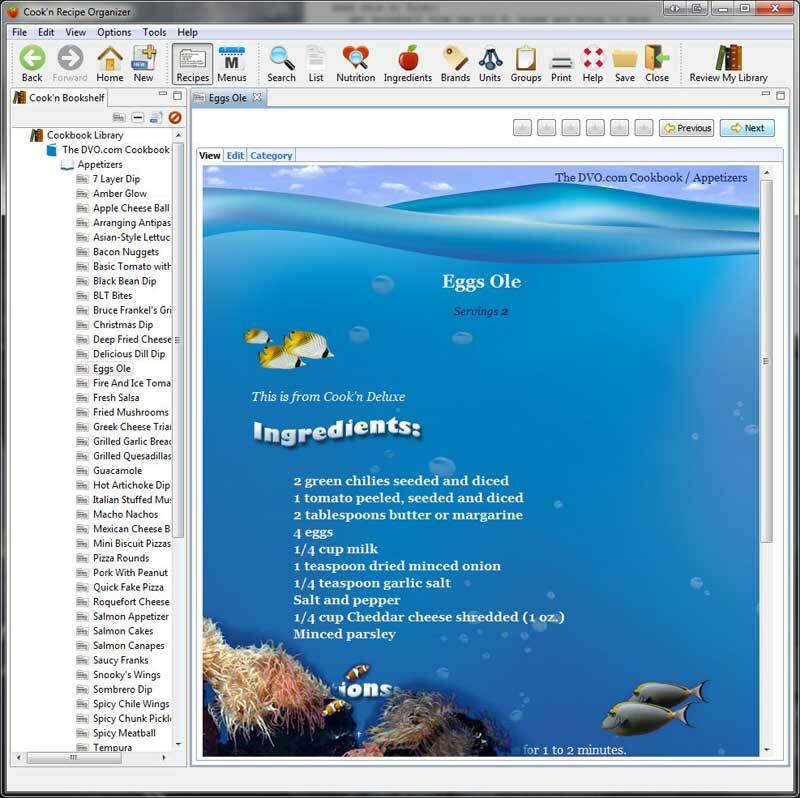 In addition to recipes, I can add food items to my menu too. 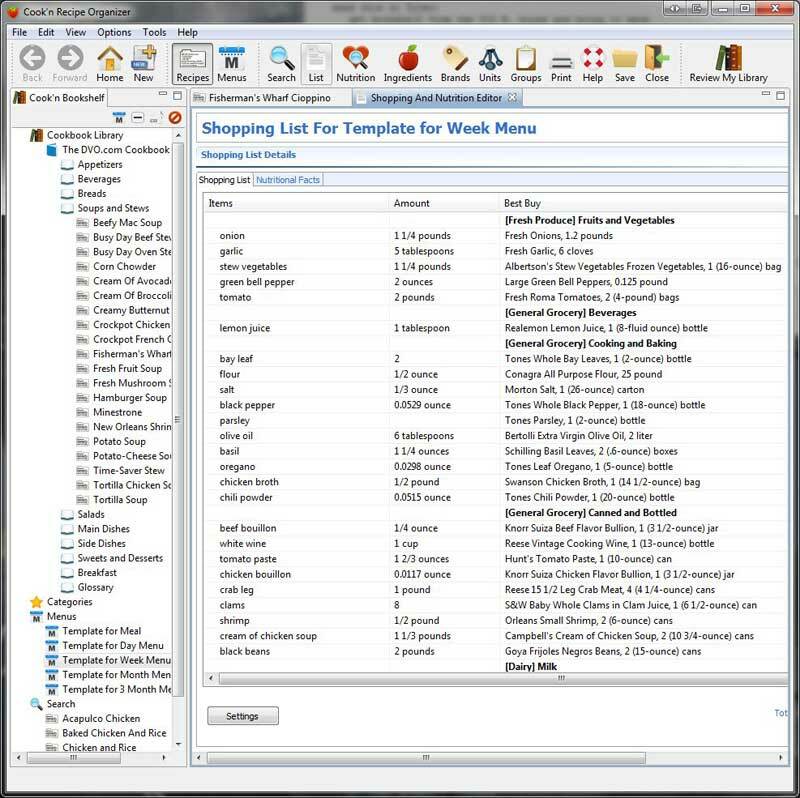 When my menu is complete, I just click List on the Toolbar to make a shopping list. 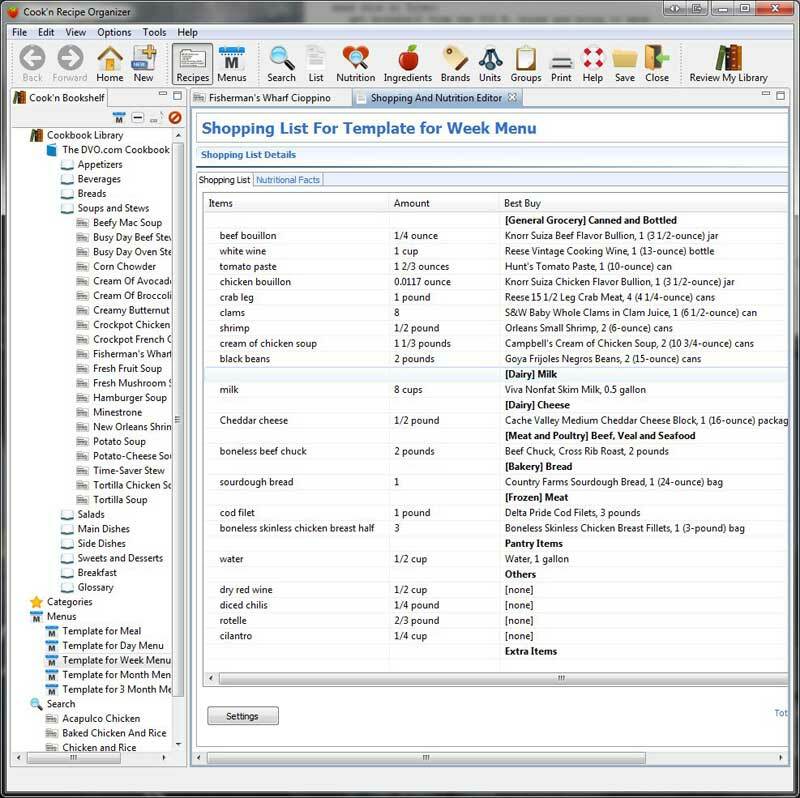 When Cook'n makes my shopping list, it combines like items and converts them from recipe units (cups, teaspoons, and tablespoons) to store units (ounces and pounds). 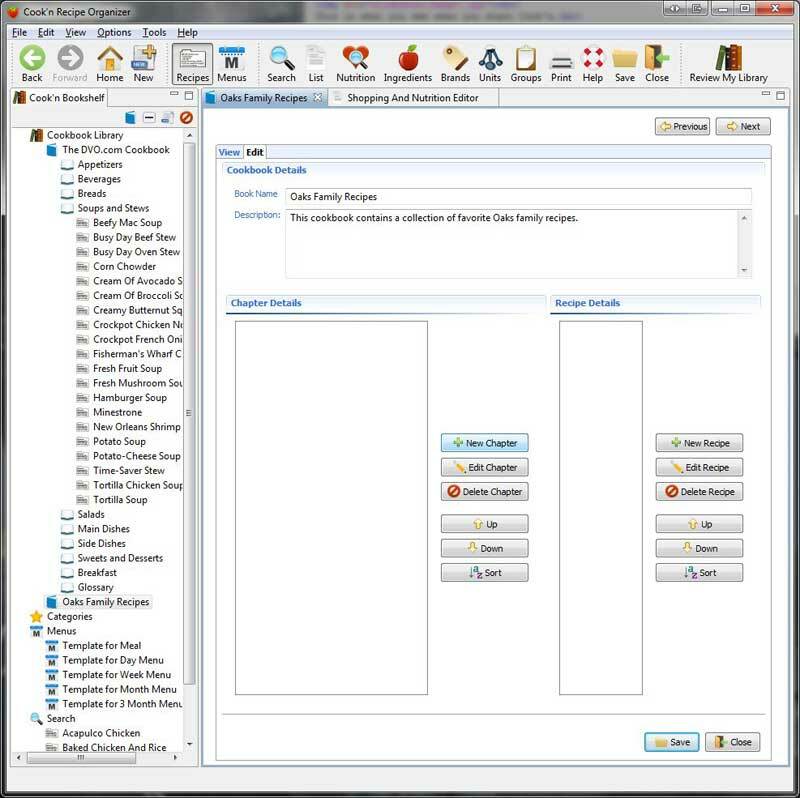 Then, it organizes the items by aisle to help me save time and money at the grocery store! 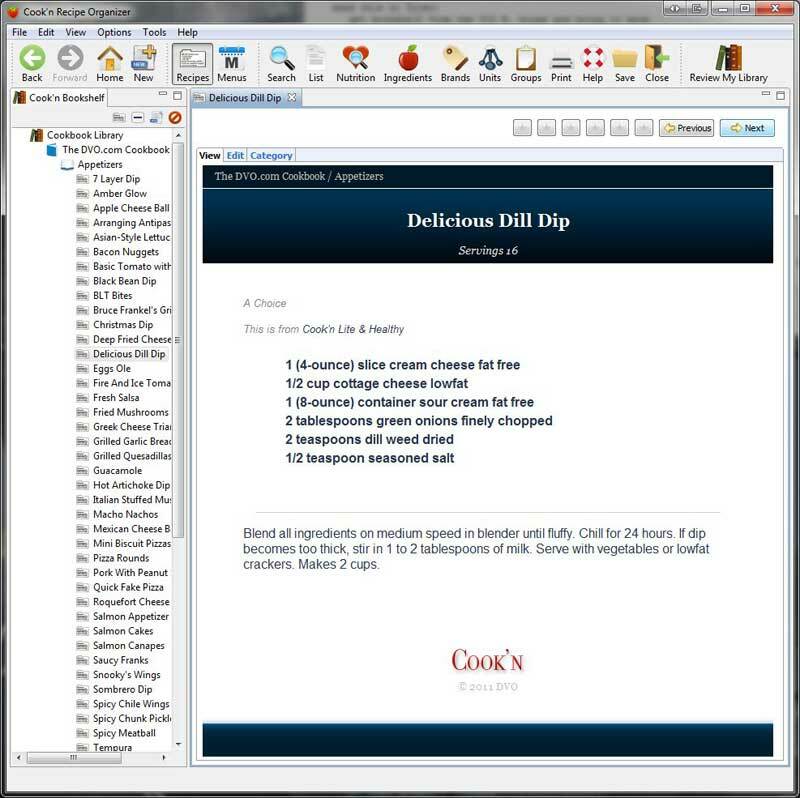 With one click, Cook'n analyzes the nutritional value of your recipes too. Try doing this by hand! Yuck! 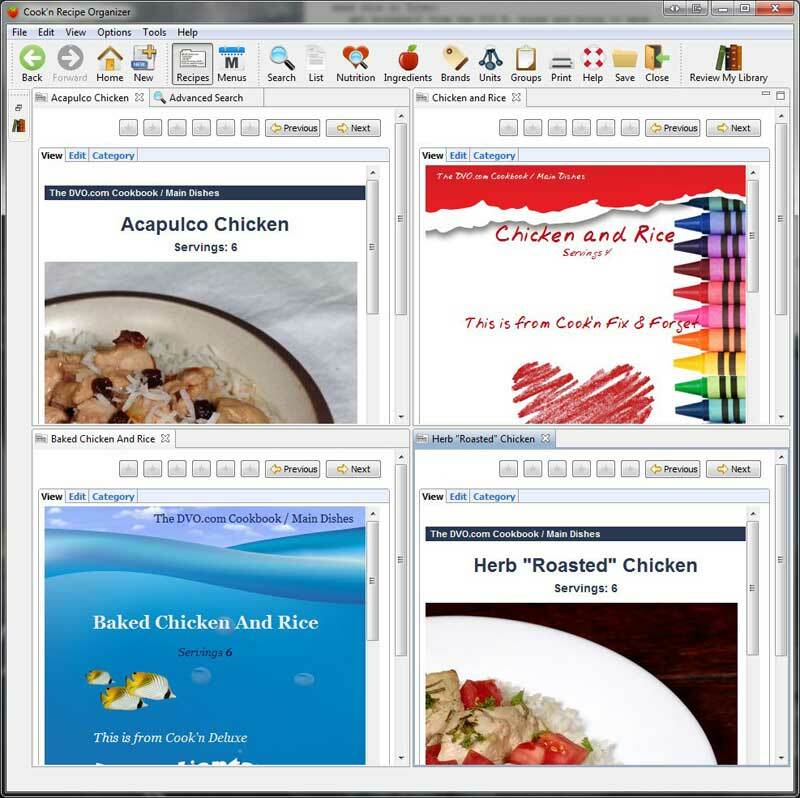 Creating your own personal cookbook is really easy to do. 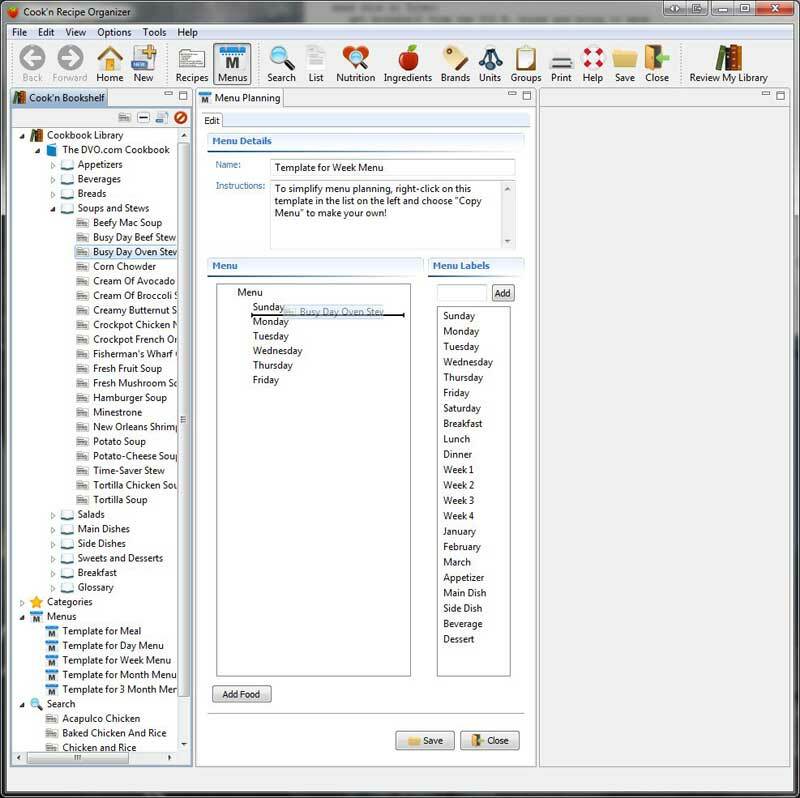 Just click the "New Cookbook" button. 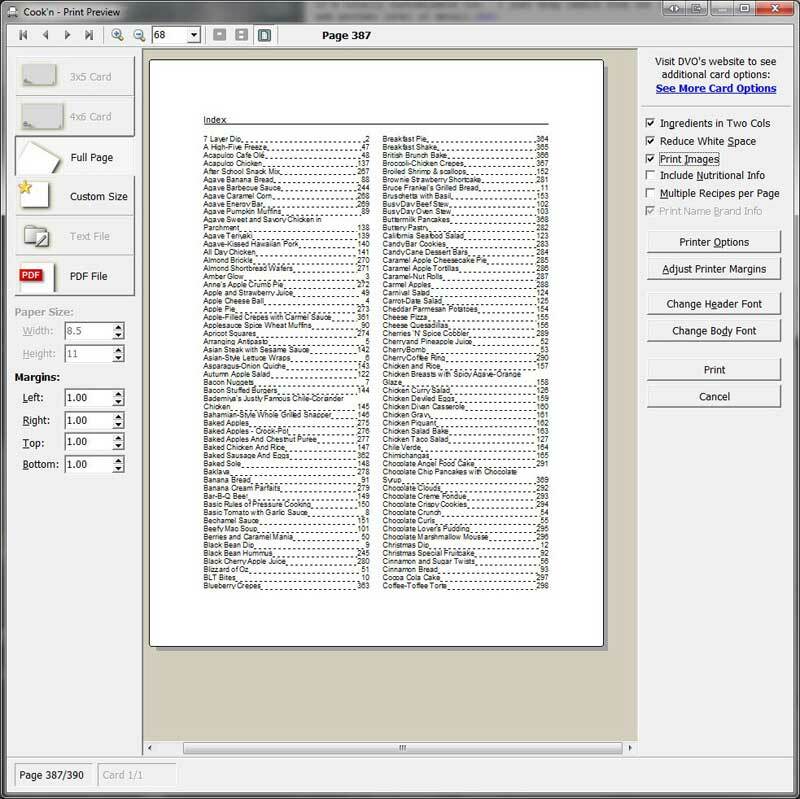 Enter your cookbook name and a description and then click the "New Chapter" button. 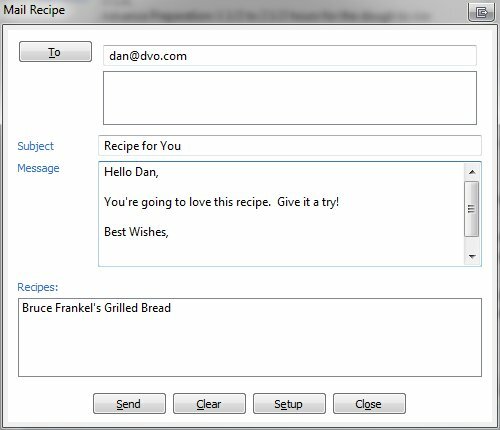 Click "New Recipe" to enter your own recipes. 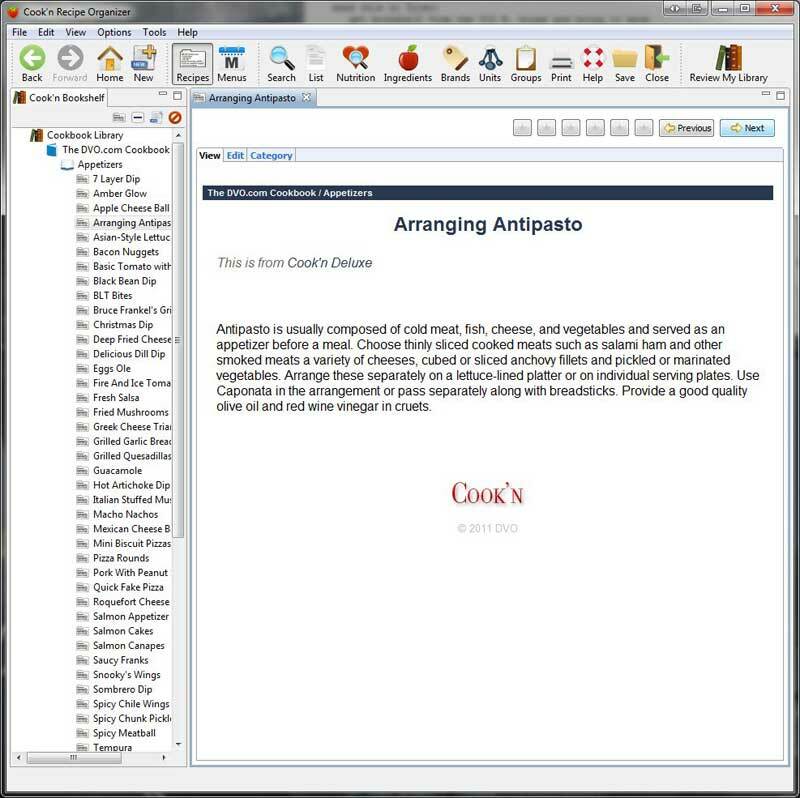 Entering recipes into Cook'n is easy because Cook'n's "Quick Fill" feature does most of the typing for you. 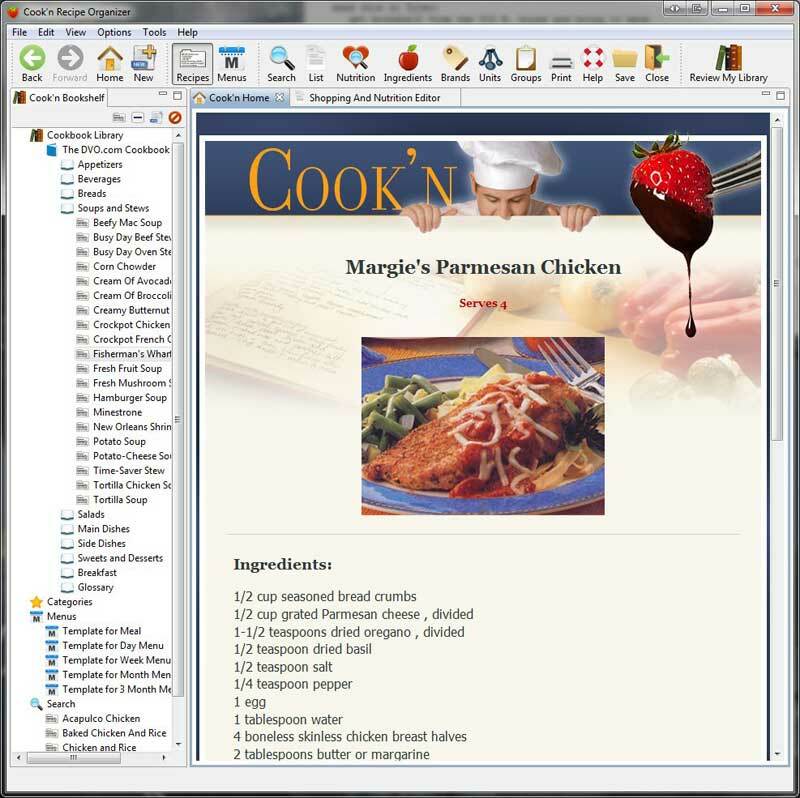 Just press "ta" for "tablespoon" and Cook'n fills in the rest! Type 'b' for "butter" and Cook'n fills in the rest! 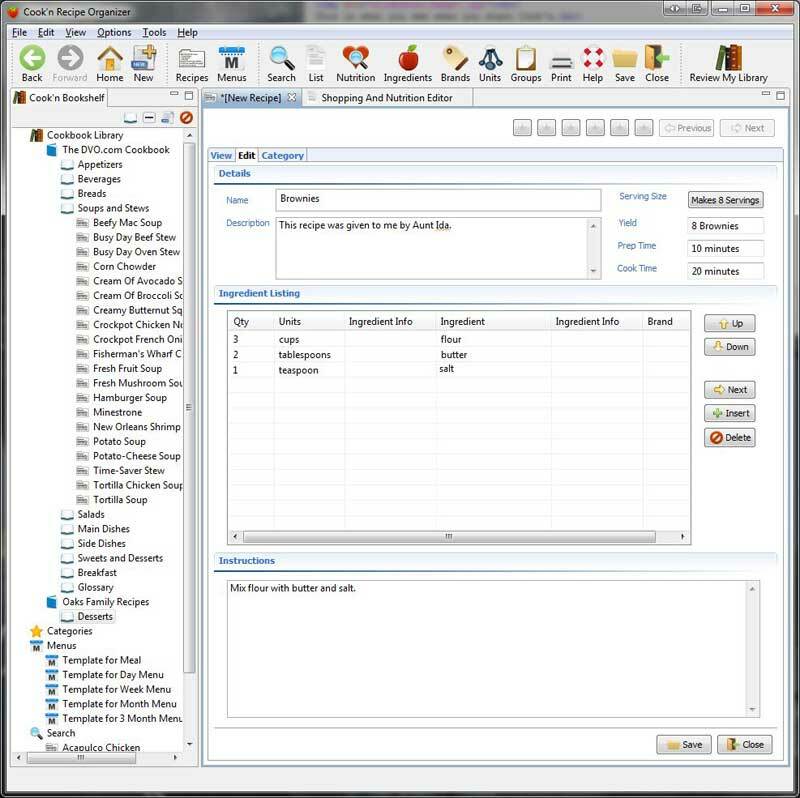 Enter the Instructions for preparation, click Save...and badabing! That's it! 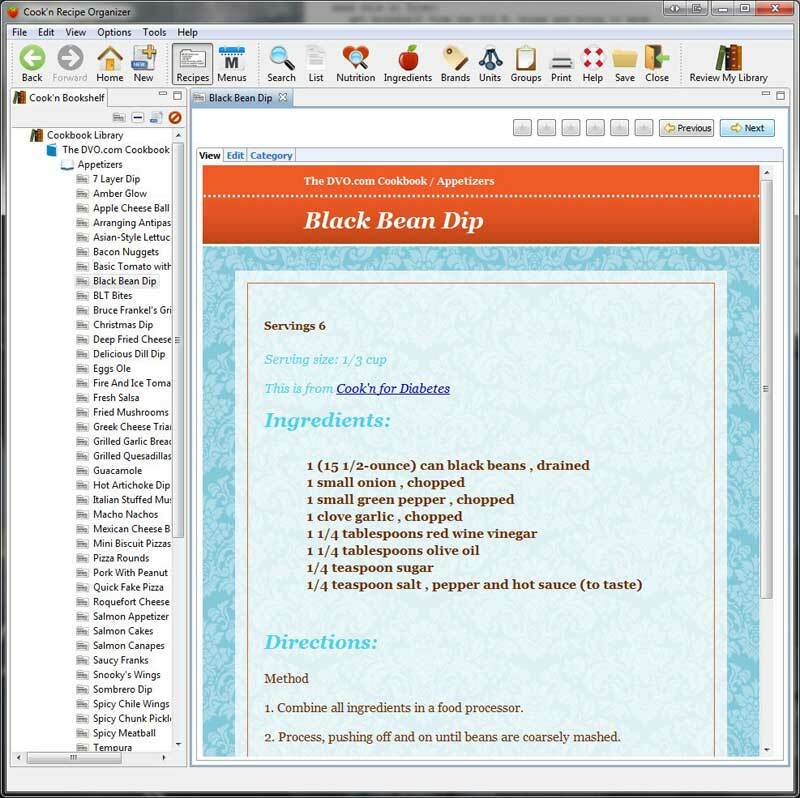 Clicking back to the View tab will display your recipe in a fun, colorful, graphical way. 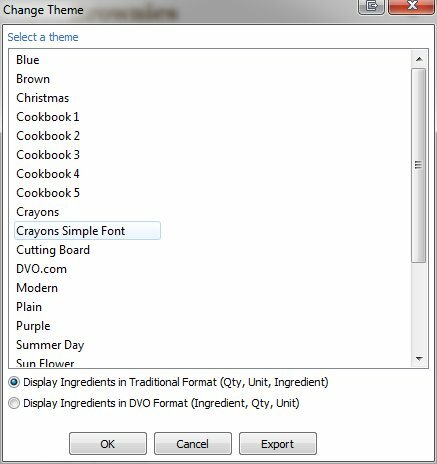 Customize this recipe's appearance by clicking Options->Change Theme. 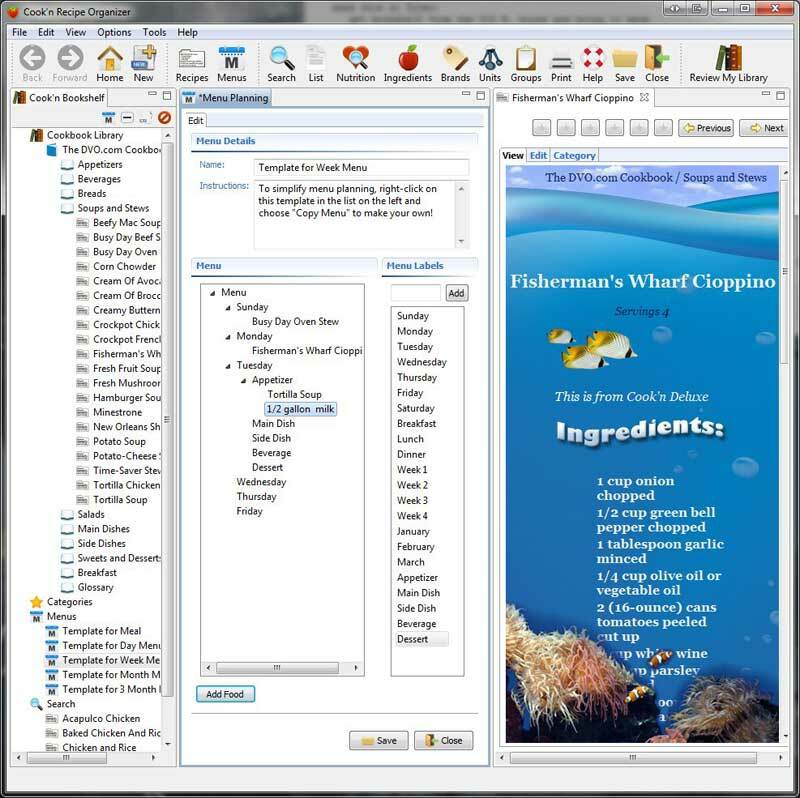 Select the theme you want and Cook'n will re-draw your recipe with the new theme. 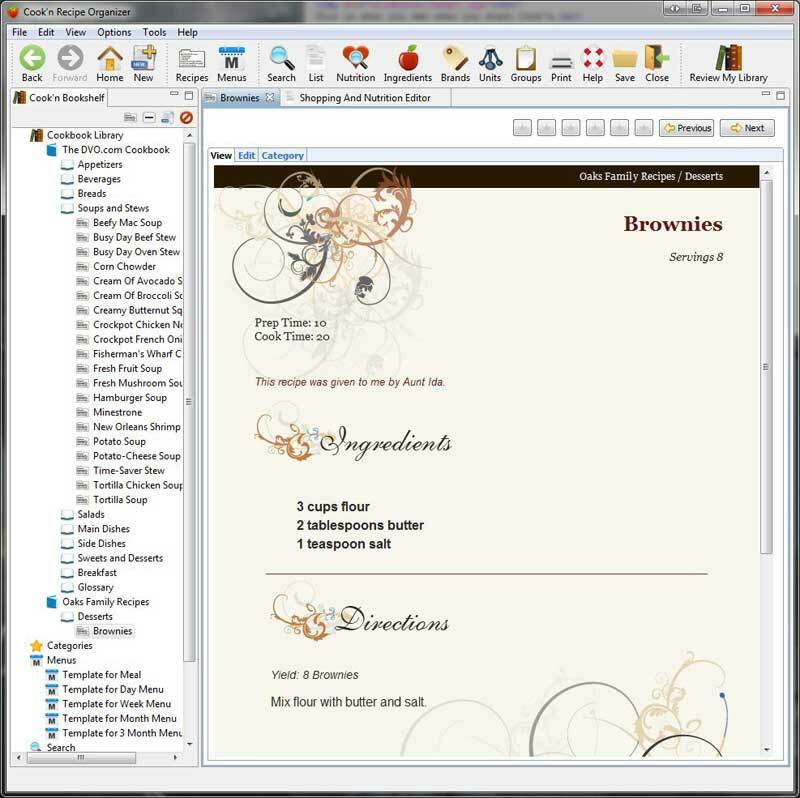 That's pretty cool...but I don't know if this "Modern" theme is the best fit for this recipe. There we go...this is much more like it! 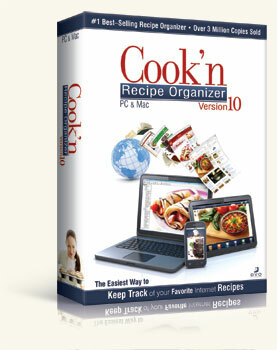 The links on the Cook'n homepage are updated on a daily basis. Clicking the "Newsletter Sneak Preview" link, for example, will show you a new article from our monthly newsletter. Today's newsletter article happens to feature a really good recipe. 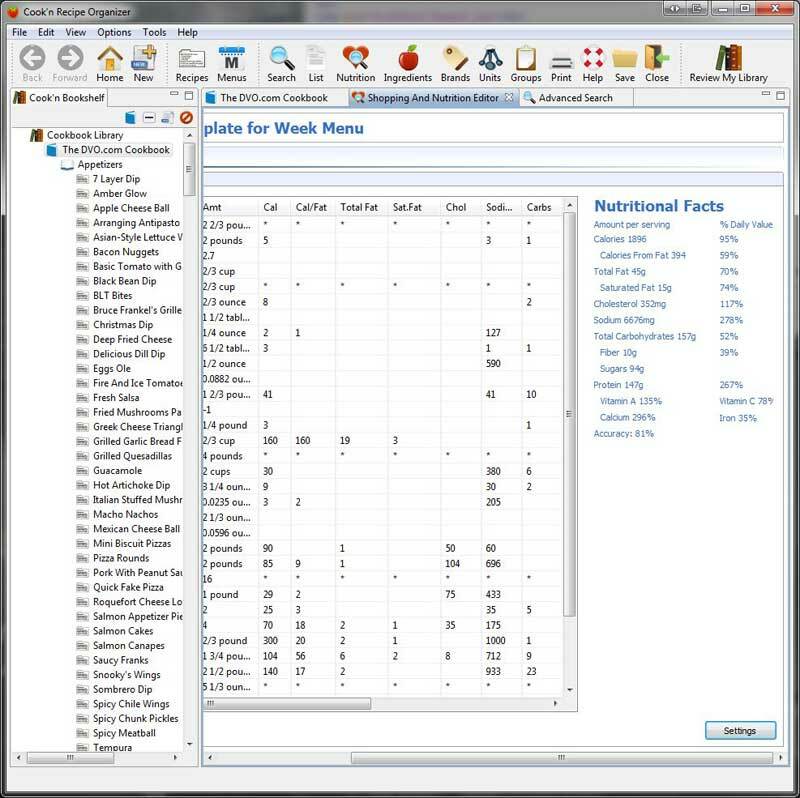 In addition to letting you organize all of your own recipes, adjust serving sizes, search your recipe database, print a family cookbook, e-mail recipes to family & friends, and analyze nutritional value, new content is being served up dynamically to your Cook'n Homepage daily! There is nothing like Cook'n! Join the Cook'n Family today! 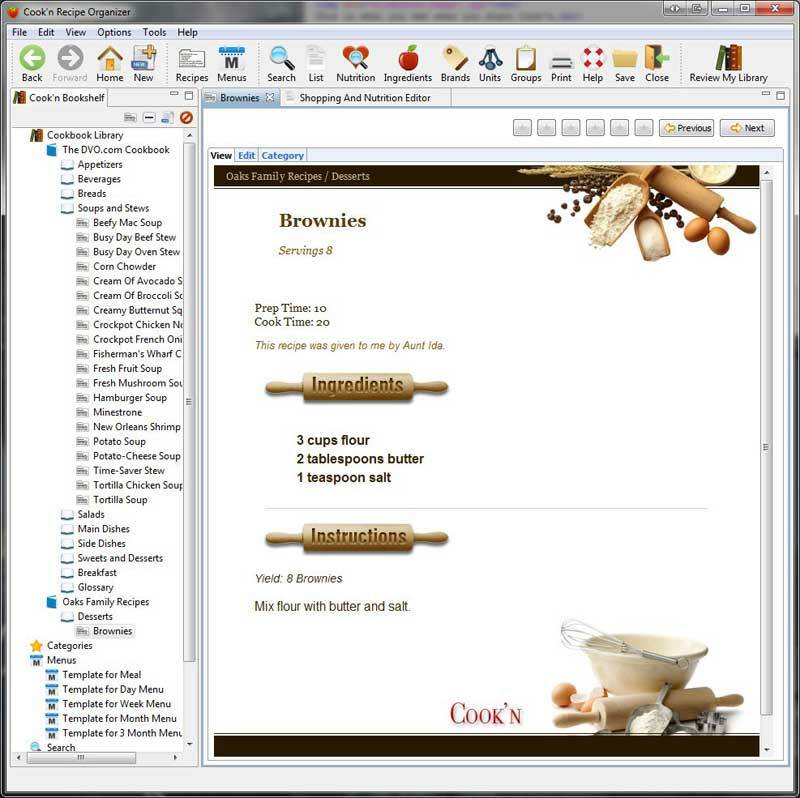 Download Cook'n right now and in 2 minutes you can start entering all of your own favorite recipes! The only question is, since you get a free cookbook of your choice with purchase, which one are you going to choose?